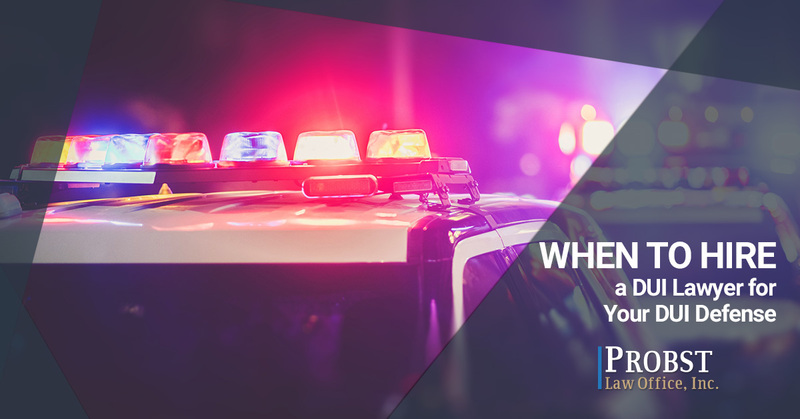 Driving under the influence is considered a crime in every state, and if you find yourself in the midst of a DUI charge, you might find yourself wondering when you’ll need the help of a qualified and experienced DUI lawyer in Columbus. We’ll discuss the benefits of hiring a Columbus DUI lawyer for your DUI defense in this blog post as well as other relevant information regarding your case. At Probst Law Office, our Columbus criminal defense attorney, Michael Probst, has helped many individuals with their DUI cases, always putting their best interests first. With more than 15 years of experience under his belt, Probst is an established DUI lawyer in Columbus and he’s known for providing effective and reliable legal counsel. Continue reading for more information about when to hire a Columbus DUI lawyer for your DUI defense, and for more information, schedule a consultation at our law firm today. It’s always beneficial to get a professional opinion from an experienced Columbus DUI lawyer for your DUI case, especially if you have no previous legal experience or training. DUI laws are constantly evolving, and it’s important that you receive the proper representation for your defense. Choose an attorney you get along with and one you feel will best serve you. If you’re unsure of what else you may need to bring, don’t be afraid to ask the DUI lawyer you’re consulting with — they are usually more than happy to help. Since most criminal defendants legally have the right to an attorney, you can either choose between one that is appointed to your case by the court (a public defender) or you can hire your own (a private attorney) if you can afford to. Is there a difference between getting a public defender for your DUI case versus a private DUI lawyer? The answer is yes, and we’ve listed some of the main differences below. Handle numerous criminal cases at once, including DUI cases. Sure, they have extensive knowledge, but they might have a lot on their plate at once. Generally familiar with the district attorneys and judges. They might be familiar with how these DAs and judges will react to your case. You have no say in who this DUI lawyer will be. Comes with a price point, but often specialize in DUI cases, meaning they’ll have more extensive and in-depth knowledge. You’ll have the same attorney representing you during and after your court hearing. DUI lawyers typically are used during your court hearing and in following DMV proceedings. You get to choose who your DUI lawyer will be. Can help you reduce the time you spend in court. We never recommend representing yourself in a court of law, unless you absolutely know everything necessary regarding DUI defenses and have previous legal training and experience. At Probst Law Office, our Columbus DUI lawyer is well-versed in DUI and DWI law, and we can assist you with your DUI defense. For more information or to schedule a consultation, contact us today. You can reach us by calling (888) 223-3741 or by completing our form online.